Cheeseburger meets baked potato in this easy stuffed potato recipe! 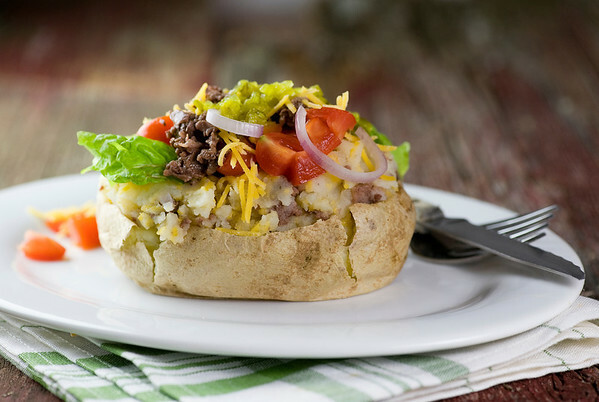 Cheeseburger baked potatoes may just be your new favorite fun supper…all the goodness of a cheeseburger in a scrumptious baked potato topping. Oh, do I love a good cheeseburger! The Southern husband and I are always, always, always on the hunt for the Next Great Burger Joint, and have energetic debates about the pros and cons of whatever burger we have last experienced. And in the meantime, I spend a fair amount of time figuring out how I can cheeseburgerize items that usually don’t involve ground beef and cheese. I’m not sure what took me so long to work my way to baked potatoes, because once the idea finally dawned on me, it seemed pretty much like it was meant to be. Those of you who have been following this blog for a while might remember that last summer I made stuffed taco potatoes, and that’s when the idea of the cheeseburger potato started percolating in my head. Now, we’ve all had baked potatoes that are topped with all kinds of good stuff, but a cheeseburger topping just wasn’t going to do it for me. Because let’s face it, you would (if you were me) gobble down all that cheeseburger topping goodness and then be faced with a naked, toppingless baked potato. I’m sure there are other ways to make it work, but I don’t have that kind of self-control. The cheeseburger had to be worked into the potato in order for it to reach the kinds of heights I knew it could. Cheeseburger meets baked potato in this easy baked stuffed potato recipe!Click to TweetSo really, there was only one thing to do. I baked the potato, and then scooped out the insides and mashed them with some butter and a little cream (and if you want to be more angelic than I, half and half would work just fine.) Once I had the potato insides at mashed potato consistency, I mixed in some cooked ground beef and some shredded cheddar. And voila! Cheeseburger Baked Potato! Now, I know cheeseburger toppings are a very personal thing, so feel free to mix things up topping wise…just don’t skip the mashed potato part, whatever you do. Aside from that essential step, improvise away! Cheeseburger meets baked potato in this easy stuffed potato recipe! Cheeseburger baked potatoes may just be your new favorite fun supper. Scrub potatoes and pierce several times with a fork. Microwave until tender, about 10 minutes. Cool slightly. While potatoes are baking, brown ground beef in a skillet until cooked through. Drain and set aside. When potatoes are cool enough to handle but still warm, cut an oval in the top of each one and scoop out the insides, leaving the skins intact. Mash the potato with butter, and then stir in cream. Mix in half the ground beef and half the cheese. Season to taste with salt and pepper. Stuff the mashed potato mixture back into the potato skins. If you want the remaining cheese melted, sprinkle it over the top of the potatoes and microwave for about a minute…otherwise proceed to the next step! Garnish the potatoes tucking lettuce pieces into each one, then topping with remaining ground beef and cheese, tomatoes, shallot and relish…or anything else you like on your potatoes! Serve at once. here for a great burger too!! Genius idea!! The.Boy. has developed a strong liking of soy crumbles (that mimic ground beef) so I am so going to try a veg version on for size for him! Oh my word! Can”t wait to try this. My hubby and I sound like you guys squirreling out good burger joints and then discussing them spiritedly! Superbowl Sunday I have to make a particular burger for hubby (chilidog cheddar burgers with bacon that I learned from Rachel Ray….note, he gets this on Superbowl Sunday and maybe one other day during the year as ….well…you can guess…so fattening, but so good…) Can’t wait to try your potatoes! We just had this for dinner, and it was very easy and delicious. My boyfriend gave it a 10/10. …but…but…where’s the BACON?!?! I guess you implied it when you said, “Now, I know cheeseburger toppings are a very personal thing, so feel free to mix things up topping wise…just don’t skip the mashed potato part, whatever you do. Aside from that essential step, improvise away!” Seriously though…this is genius!